The Egyptologist Samuel Birch (1813-85) began to study Chinese at school, and obtained his first post at the British Museum cataloguing Chinese coins. He maintained his interest in Chinese civilisation throughout his life, but also collaborated with C. T. Newton on a catalogue of Greek and Etruscan vases, and with Sir Henry Rawlinson on cuneiform inscriptions, while also specialising in the examination and cataloguing of the Museum's growing collection of Egyptian papyri and other artefacts. Birch describes this two-volume, highly illustrated work on ancient pottery, published in 1858, as filling a perceived need: 'A work has long been required which should embody the general history of the fictile art of the ancients.' 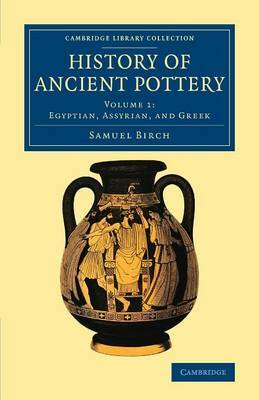 Volume 1 covers the composition and techniques of the pottery of ancient Egypt and Assyria, with notes on Jewish Phoenician wares, and begins an examination of the techniques and art of the Greek ceramicists.